Cache La Poudre Elementary, an IB World School (CLPE) opened in 1913. 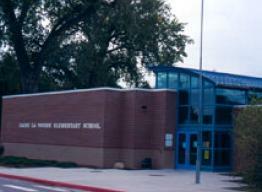 It is situated near the beautiful Cache La Poudre River which provides a gorgeous backdrop for this community school. CLPE is proud of its 100 year heritage and is known in the community as a friendly, caring place. The school community works together to create an inquiry based, child-centered learning environment with high expectations. CLPE is an International Baccalaureate (IB) school authorized in June of 2014. CLPE offers the Primary Years Program for grades K-5. The PYP develops students’ academic, social, and emotional well-being while focusing on international mindedness and strong personal values. The PYP nurtures independent learning skills, encouraging every student to take responsibility for their learning. The program incorporates local and global issues into the curriculum asking students to explore six related transdisciplinary concepts and to consider how to apply them to their lives. CLPE specials are art, music, physical education, media/technology, and Spanish. Students may participate in a variety of extracurricular activities before and after school. Activities may include Lego Robotics, Running Club, GASP (Girls Advancing Science Progress), Little Kids Rock, Choir, Morning P.E., Chess Club, and Art Club.